Our family room is the most used room in the house. Even more than the kitchen. What does that say about how much I cook? 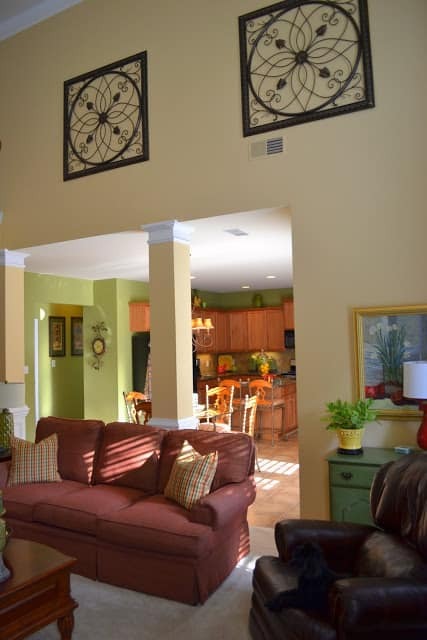 This is the view into our family room as you enter from the foyer. It’s extremely difficult to capture the correct wall color in photographs of this room. See that spot on the left end of the couch? That’s were I blog. Step on into the room and you can see how open to the kitchen it is. That black blob draped across the back of the couch is Maggie, aka Diva Dog. She came running in just as soon as she heard the camera clicking away. Look to the right a little and you’ll see Pookie’s favorite spot in the room and the bane of my existence. It rocks. It swivels. It reclines. It’s leather. It’s perfect, according to Pookie, that is. I’ll just keep my opinion to myself. 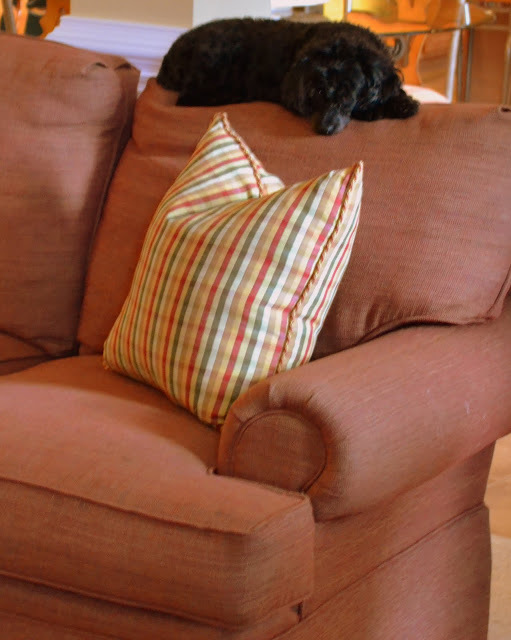 How does Diva Dog know that I’m trying to take a pic of that chair? 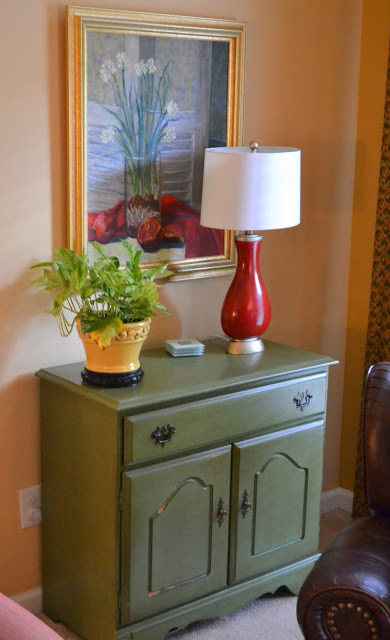 The picture above the green chest is another painting done by my Auntie Syl. 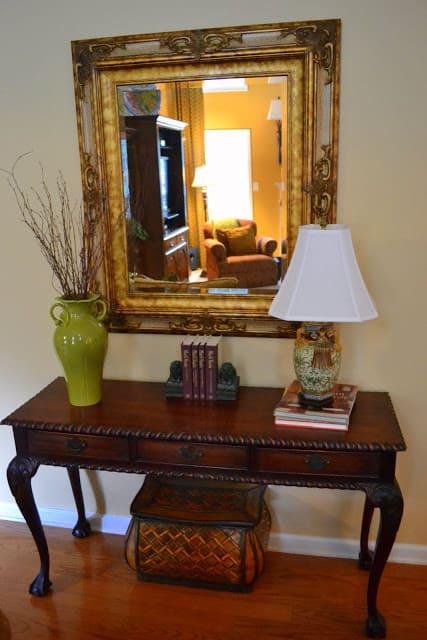 Look to the left and you’ll see this console table and mirror. That mirror is a little more garish than I’d like. I tried to tone it down by applying stain to it, but the only way it’s going to get any darker is for me to flat out paint it. Maybe I’ll get around to that one of these days. This little lamp is one of my favorite things in the room. 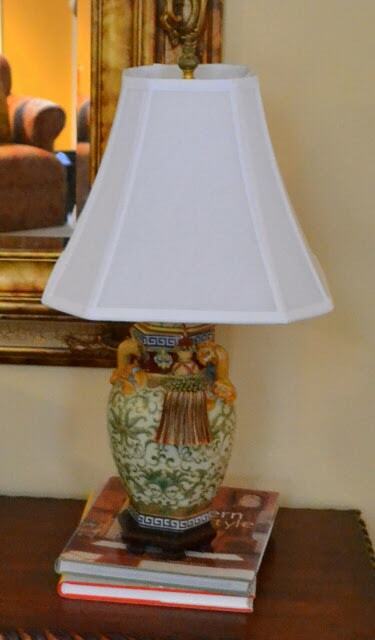 It was a vase that I found and had made into a lamp. These chairs sit in front of the table and mirror. There’s a walkway in between the chairs and the table. The doorway to the left leads to the foyer and living room. The doorway to right leads to the dining room. If you enter from the dining room, this is the view into the family room. You can see the entrance to the office to the right. Here’s a full on frontal shot of the bookcases. We had to remove the doors to the center section to fit the flat screen tv in there. The little black things up on top are speakers. An even closer look. The back of these cases was the same brown as the rest of the wood. I didn’t like how dark it was, so I purchased a sheet of 1/4″ plywood, applied burlap to it with spray adhesive and put it behind the glass shelves. For a little extra color, I added some decorative cording (the kind you use to trim pillows with) all the way around the top, bottom and sides. I just used my hot glue gun to attach it. Here’s the bookcase on the left. I really like the burlap. It adds texture as well as providing a lighter backdrop for everything. …and using two story tall drapery panels. I’ll end the tour with a bird’s eye view and a tip. 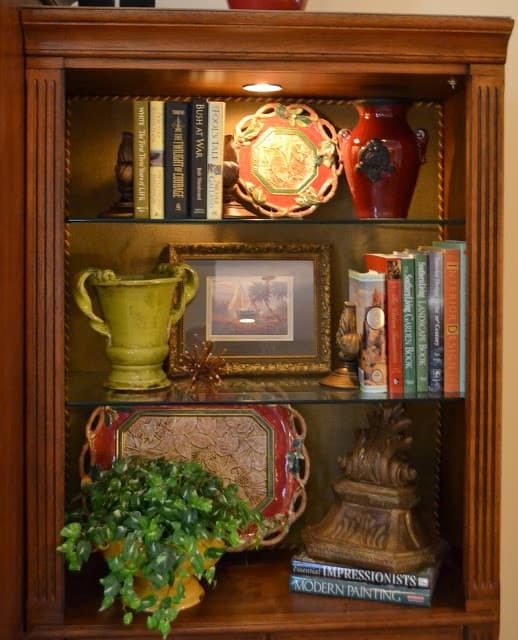 Here’s the tip – do you have bookcases that you would like to display items on top of, but can’t because the top of the bookcase sits lower than the moulding? That was my case here. I couldn’t just elevate items on blocks of wood because you can see the tops of the bookcases from above. We took care of the problem by adding a sheet of luaun (or whatever you call that stuff used on the back of bookcases) cut to fit the shape and size of the top of the bookcase and simply laid the pieces on top. They aren’t held down with glue or nails or anything. We purchased the luan at Lowes and they cut it to size for us for free. Oh okay, Maggie…I’ll include one more picture of you. Sheesh! Linking up to Funky Junk Interiors and Savvy Southern Style. Wow, this room is so lovely! 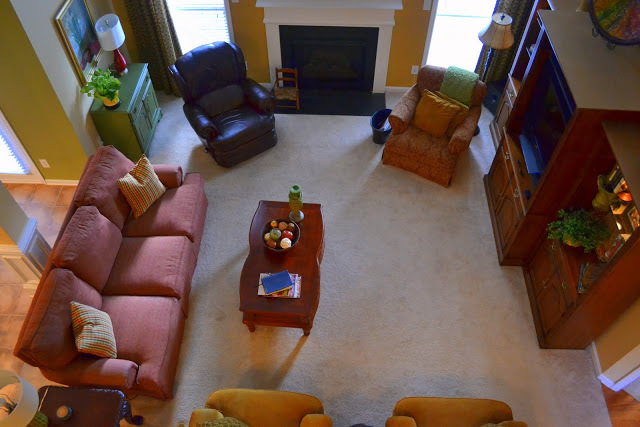 We may have similar tastes in colors & the over-all “welcome” feel we like our homes to project. You’ve done a wonderful job of decorating to make it feel so cozy and inviting. I did the laundry room, too, and it is adorable. I’m still working on ours & want it to be functional but also very fun to work in. It’s a “walk-through,” so it will take some time to plan out the space. I really enjoyed both tours! Your home is lovely and the color palette is so warm and inviting. I like your solution for the top of your living room shelving unit. The two story window treatments are fabulous. LOVE your home and the new look of your blog page. Great job!! Beautiful home! Your living room looks gorgeous. Thanks for sharing. Visiting from Met Monday. Your home is beautiful! What a talented Aunt you have, what beautiful painting. The backing to your built ins looks amazing…very nice touch! This really shows how a room can be comfortable and cozy and still be beautiful. No wonder your husband and dog spend their time in here. I love the idea for the backs of the bookcases. I have the same problem with mine being too dark. You can only see the contents when the lights are on. I will have to give it a try! Thanks! Very pretty tour! The window treament are grand and the colors inviting! What a beautiful home you have! I’m enjoying looking around on your blog this morning. Thank you so much for stopping by my new blog. I will ask my sister about adding one of those subscribe by email thingys. Since I’m just getting started, I’m still refining it a bit. I still need to add a blog roll too. Have a great Monday! Your home is so pretty. I love the colors! It’s so homey and beautiful. Great job! 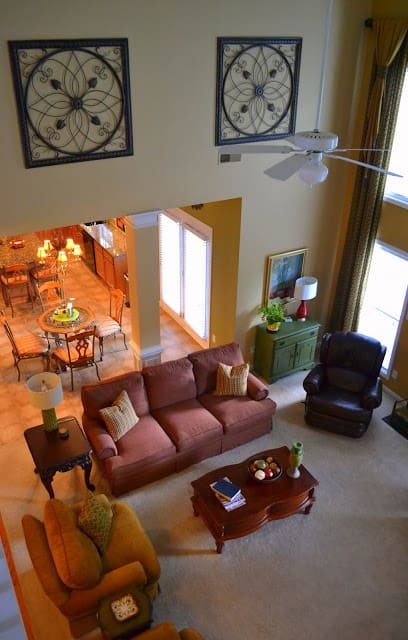 Your family room is beautiful! Although it posses it’s own problems with all the doorways and high ceilings, you’ve done a marvelous job with your decor! Ha! Diva Dog has a friend in my Mattie Gray. Apparently they both to have the spotlight. Thanks for sharing your space in my “Room by Room” series! You have a beautiful home and I love all the colors! Your dog is precious! Lovbe your home! The colors are great. Beautiful.Thanks for sharing. Beautiful home– very cozy. I love your comment about your husband’s chair. My husband and I debate about this because I’m not a fan of them…they are so big (and other things)! I told him he can have one if he puts it in the basement…too bad (for him) our new house is on a slab! teehee! Your home is so much like my girlfriend Ro at Hint of Home.blogspot. 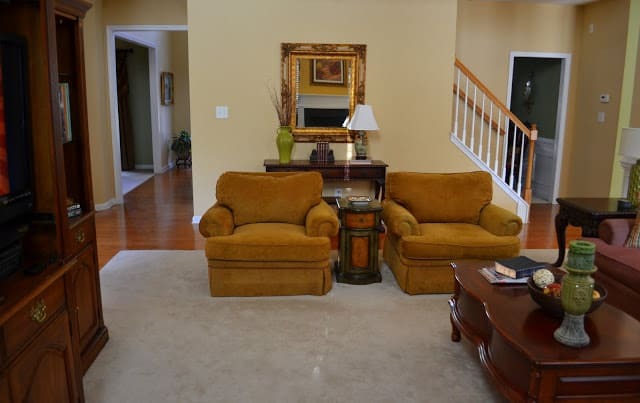 I really think it is the same layout just the other way….You have a beautiful family room….You did a great job decorating it!! Your living room is so gorgeous! I just found your blog from Kristen’s linky party. I am now your newest follower, come check me out if you get a chance. This is such a pretty room. 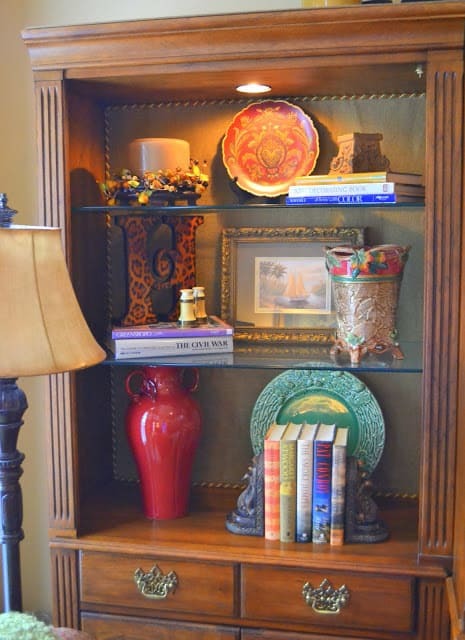 I love the way you accessorized your shelves. Love the layers. Thanks for joining Wow. You have a beautiful home and this room is simply gorgeous. Aw, loved seeing your sweet Maggie too. I enjoyed my first visit too your lovely blog. I’ll be back again. This is such a beautiful room! 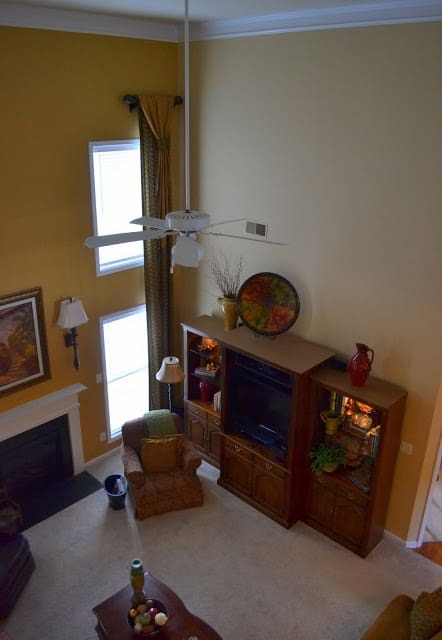 The soaring ceiling is incredible and yet it still feels so warm and cozy in there! Thank you so much for sharing your lovely home with us at Inspiration Friday! I love your home, very warm and inviting. Have you ever considered a fabric ottoman in front of your sofa? From the above view you have plenty of space. I did that and it’s wonderful when your on the computer to put your feet up… and I bet your dog would love it! 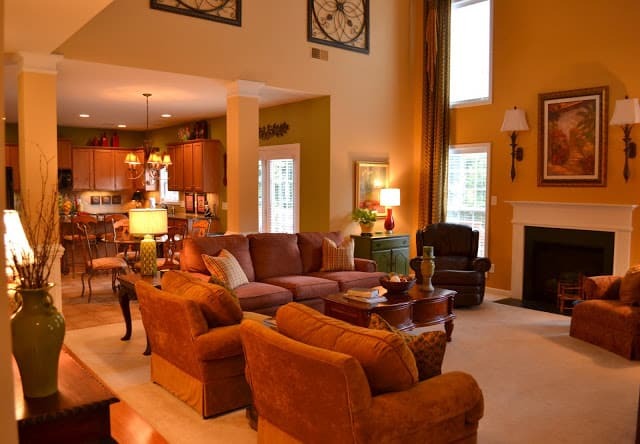 Hi Suzy, Your home is beautiful and I love the colors you used! Thank you so much for linking to the Open House party this week and I am now a follower. Okay, I guess I am moving in. 🙂 You have amazing style. I love the details that you’ve added to every inch of that room. Amazing, all of it. Seems so welcoming & cozy! Thank you very much for sharing this @ Show & Share! what a lovely home. I’m glad my dogs aren’t the only camera hogs! Oh, my, what a lovely room. What a beautiful home. Thank you for opening up your home to us! Thank you so much for sharing your post at Savvy HomeMade Monday! I hope you will come back and party again! So glad you came by and linked up with Favorite on the First! Hope you can do a post on Maggie and link it up then! P.S. Love the fabric and cording in the back of the bookcases! I love your home – the colors are fantastic! We just purchased a new home with 4100 sq feet of blah! 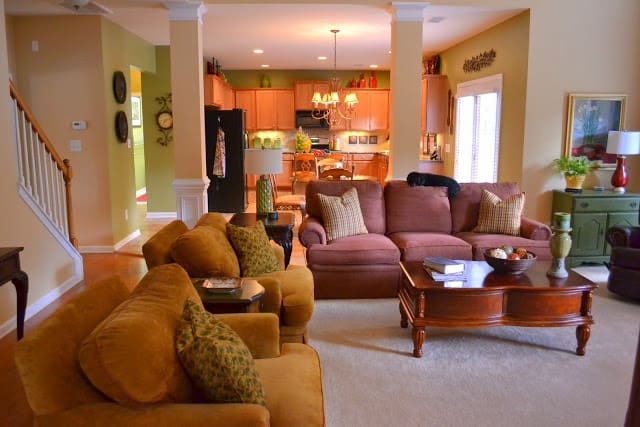 May I ask what colors you used in the family room/kitchen! I love how the three colors compliment each other! Thank you! Hi Teresa. Thank you for your sweet comment! 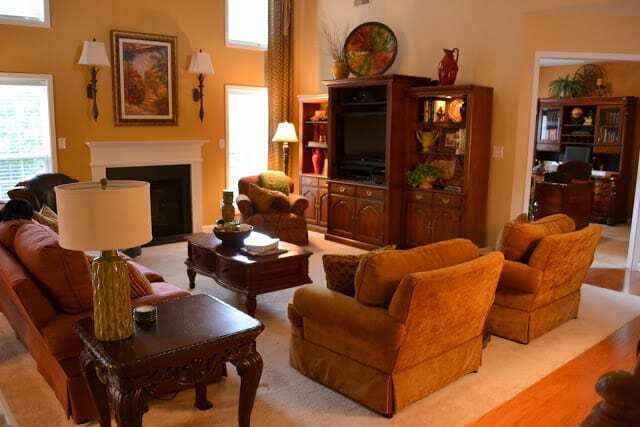 The family room is Lowes American Traditions Oatlands Buff Gold #3004-8A. The kitchen is Sherwin Williams Lemon Verbena #SW7726. Hope this helps! love your home! 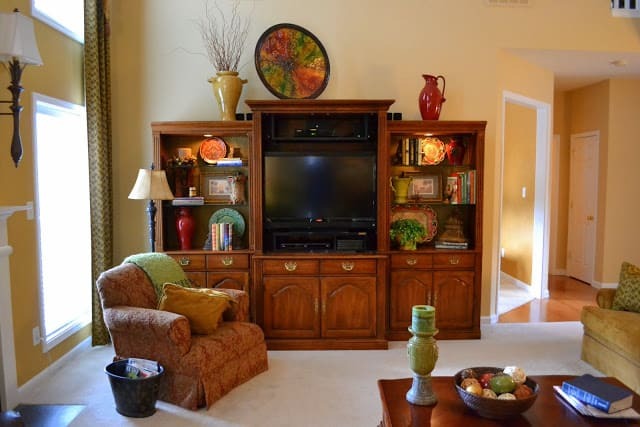 thank you for sharing–your family room is so warm and relaxing–can i ask where you purchased the furniture? it is exactly what i am looking for in our family room! thanks again for sharing your gorgeous home! I purchased those chairs several years ago at a local furniture store called Priba. I’ve had them reupholstered once so I can no longer see the tag to tell you what brand they are. I’m sorry I wasn’t able to be of more help! Cozy’s a great word to describe the place. There’s a lot of room for moving around, while the placement of furniture, and the colors and lights give such a comfortable feeling. Heh, I can understand why you’d be blogging in that living room. You’ve done an excellent job in designing the room! This is a great home and so beautiful also. I love very spacious places. So nice to live in a place like that.